The genus Alsobia belongs to the New World Gesneriaceae. Episcia and Alsobia are closely related genera. 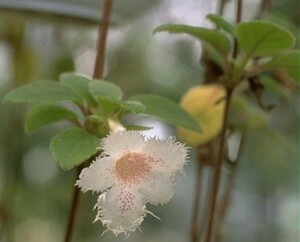 At one point, the Alsobia group was considered to be part of the genus Episcia. The two genera share a generally stoloniferous habit, where rapidly growing stems are produced from the leaf axils, which at the tip are plantlets. These plantlets root readily and in nature can result in a large mat of plants, each of which may have originated from a single plant. However, the two genera are sufficiently different that most botanists have accepted their separation into separate genera. There are at least four Alsobia species, as well as hybrids between species. Alsobia dianthiflora is a small-leaved, compact plant that produces large white, frilled flowers and numerous stolons. A. punctata is a much larger and coarser species with similar large, frilled flowers which are white with purple spots. It is also stoloniferous. A. chiapensis, originally distributed as A. sp. ‘Chiapas’, is a shrubbier plant and does not produce many stolons. A recent collection from Belize distributed as Alsobia baroniae, originally distributed as A. sp. RM2010, is a robust, stoloniferous plant with un-frilled, fat flowers with variable purple markings on the face of the flower. More commonly grown than any of the species is A. ‘Cygnet’ and the similar A. ‘San Miguel’. Both are primary hybrids of A. dianthiflora and A. punctata and are intermediate between the parents in terms of leaf size and overall appearance. The flowers are heavily frilled and have the purple spots of the punctata parent. Alsobia do not typically require as much warmth and humidity as Episcia and can do very well on an open shelf under lights, or on a windowsill. Both genera are primarily terrestrial in nature, where they function as ground covers in tropical rainforests. Some Alsobia extend into the southern subtropics, where seasonally dry and cooler temperatures can prevail. They seem to perform best in a medium that is both reasonably well-drained and somewhat moisture-retentive. Many growers report good success using standard African Violet soil mixes.